An oldie but fun one. Panthor, Skeletor's answer to Battle Cat! Been wanting to do more of these kinds of speed painting/sketches... We'll see what time allows me soon. A truly awesome take on Panthor, with a suitably creepy, spectral looking Skeletor standing in the shadows behind him. 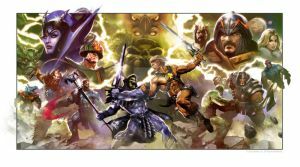 Another awesome MOTU painting! This is an Awesome Panthor! Panthor is fierce like his master. What an incredible painting! Skeletor's shadowy presence in the background just makes this. And Panthor's fur and eyes ... stunning job, man, and Faved. Panthor's the cat...next to Battle Cat, of course. Oh my word - I LOVE this! I have, apparently, a thing for Panthor - I think it stems from the fact that he is, obviously, Battle Cat's equivalent, but at the same time has such a minor role in the series (original series). There's a sort of reclusive mystery about him that makes him - to me, at least - absolutely terrifying. Not that Battle Cat isn't, but... I guess the fact that he doesn't talk makes him seem much more feral and untamed. You totally captured the fear that my mind sees in him! It rocks! One of my fav Baena pix! A little part of me would like this saddle for a bit of differentiation in MOTUC. Loving the highlighting on the saddle, and the glow of his eyes. As awesome as it always has been! It's the Skeletor in the back that makes this pic so cool (for me.) The sheer ability to create his image the way you did is inspiring. Wow, that's incredible Baena! Very cool and atmospheric. man, ypu shpuld be doing art for mattel, did you see those crappy packages from the new MOTU vs DC? This is absolutely amazing, man!